Eugene Laverty set the early pace in practice in Qatar ahead of the final round of the World Superbike Championship. Eugene Laverty set the early pace in free practice at the final round of the World Superbike Championship in Qatar as Jonathan Rea crashed out unhurt. World champion Rea posted the second fastest time on his Kawasaki before the spill, which forced him to sit out the remainder of FP1 at the Losail International Circuit. World champion Jonathan Rea crashed out unhurt on his Kawasaki. 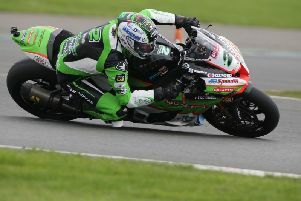 Toome rider Laverty is competing in his final World Superbike round for Shaun Muir’s Milwaukee Aprilia team after learning this week that he will be replaced by Tom Sykes in 2019, who will head up a new-look factory-backed BMW effort for SMR. After topping the times with a lap in 1m 59.290s, Rea then lost the front of his ZX-10RR two turns later, tumbling into the gravel. The Ulster rider has won the last 10 races in a row and can beat Doug Polen’s record for the most victories in a single season, with the America winning 17 times as he clinched the title in 1991. Pata Yamaha’s Michael van der Mark also crashed out and was left to watch on as Laverty powered to the top spot in the closing stages, posting a time 0.7 seconds faster than Rea’s early benchmark. Marco Melandri (Aruba.it Ducati) and Leon Camier (Red Bull Honda) finished in third and fourth respectively, with Xavi Fores (Barni Ducati) and Alex Lowes (PATA Yamaha) completing the top six. UPDATE: In FP2, Laverty was pushed back to second place by Lowes, who lapped in 1m 57.656s. Rea ended the session in third following his earlier spill, with team-mate Tom Sykes improving to fourth. Spain's Fores and Marco Melandri were the first six.